Italy, Greece and Montenegro are well within reach on this incredible 17 day two-for-one fly, tour and cruise package. Explore the stylish city of Milan, the famed canals of Venice, arts and culture of Florence and historic monuments of Rome on tour. Then, cruise among the mesmerising Greek Islands aboard the four-star MSC Magnifica on your seven night cruise. 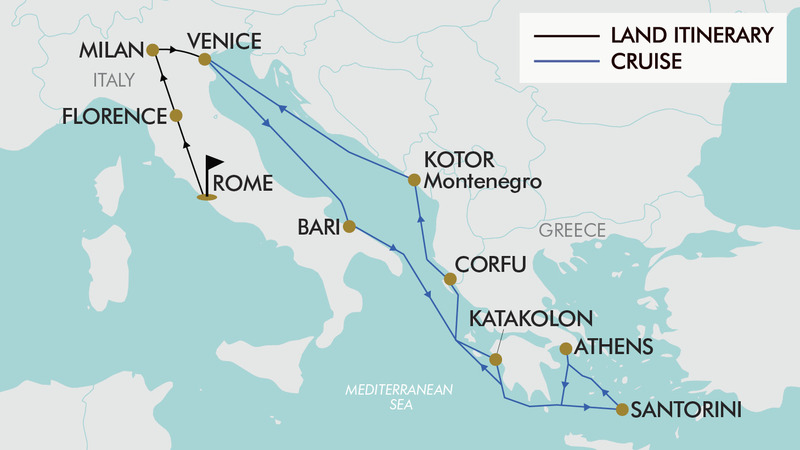 Your cruise starts in Venice and heads to the ancient city of Bari, Italy before heading towards Greece. Sail to Katakolan, the gateway to ancient Olympia; Santorini where white-washed buildings fill the coastline; and Piraeus, the port city of Athens where seafood is mouthwateringly fresh; and the pristine beaches of Corfu. Kotor in Montenegro, the last stop on your bucket list cruise, is surrounded by cliffs, cobalt coves and medieval towns. Package includes return flights, cruise, 7 nights four-star hotel accommodation, 27 meals and more - for you and a friend! Depart from either Sydney, Melbourne, Brisbane, Adelaide or Perth for your flight to Rome. Fly with airlines such as Etihad Airways, Emirates, Qatar Airways, Singapore Airlines, British Airways, Lufthansa, Swiss Airways, Austrian Airlines and Cathay Pacific to name a few (subject to availability). Please note: Due to flight availability and scheduling, some customers may be required to depart in the early morning on day 2 (to arrive on day 2). Flight schedules will be confirmed approximately 6 weeks prior to departure. After breakfast, be met by your local guide and enjoy a guided tour of Rome - the Eternal City (approx. 3 hours). The tour begins at the Trevi Fountain, which has become an iconic spot thanks to the movie ‘La Dolce Vita’, directed by Federico Fellini. The tour will take you to the streets of the old town, visiting famous sites such as the Pantheon (entrance not included); the Palazzo Madama, which houses the Senate of the Italian Republic; and the Navona Square, which was built on the ruins of the Domitian Circus. Once the tour finishes you can enjoy the rest of the afternoon at leisure. If you have your sights set on visiting the famous Colosseum or Vatican Museum during your free time, we strongly advise pre-purchasing tickets online to avoid excessive queue times. A Vatican Museum and Sistine Chapel optional tour (not included) is available for purchase in the cart. After breakfast, you will continue your Italian journey to Florence in the heart of Tuscany. Upon arrival, check-in to your accommodation and enjoy the afternoon at leisure. You might like to take in some of Florence’s beautiful sights such as the Piazzale Michelangelo, the medieval Ponte Vecchio, the Duomo, Uffizi Gallery or the Gallery of the Academy of Florence. Optional tours (not included) to the Uffizi Gallery and the Gallery of the Academy of Florence are available for purchase in the cart. After breakfast, enjoy a guided tour of this incredible city (approx. 3 hours). The tour will take you through some of the famous sights and attractions, including the Santa Maria del Fiore Cathedral and Piazza del Duomo. Piazza del Duomo, together with Piazza San Giovanni, represent the heart of the city. The most important religious monuments of Florence are here, linked by their geometric design and characterised by the typical white, green and pink marble coating. You will see the Baptistery (entrance not included) with its octagonal shape and three bronze doors; the Cathedral (entrance not included), built in Florentine Gothic style; and Giotto’s Bell Tower, regarded as one of the most beautiful towers in Gothic architecture (entrance not included). The tour will continue through Piazza Signoria to the Palazzo Vecchio (entrance not included), the town hall of Florence. Admire the impressive statues that surround the piazza, before continuing to the Straw Market where the tour will end. Enjoy time at leisure for the rest of the day. In the morning, begin your journey to Venice. Upon arrival, check-in to the hotel and then spend the rest of the day at leisure. An ancient city just waiting to be discovered. It’s worth doing an excursion just to wander around the old city of Bari (not included), an entrancing jumble of streets that are the most mind-bending places to walk around. Katakolon is a tiny port town, only 30 minutes from Olympia, the ancient home of the Greek games which can be discovered on an optional shore excursion (not included). Alternatively, the town itself is very pretty, with great local dining options, views of the sea and the chance to take a swim in the azure waters. Corfu, an island off Greece’s northwest coast in the Ionian Sea, is defined by rugged mountains and a resort-studded shoreline. Its cultural heritage reflects years spent under Venetian, French and British rule before it was united with Greece in 1864. Corfu Town, flanked by two imposing Venetian fortresses, features winding medieval lanes, a French-style arcade and the grand Palace of St. Michael and St. George. The medieval Old Town of Kotor; it’s the undisputed jewel in Montenegro’s crown. Though no longer Europe’s best-kept secret, Kotor’s sudden elevation to the tour-cruise league has failed to dim the timeless delights of its cobbled alleyways and secluded piazzas. Enclosing cafés and churches galore, the town walls are themselves glowered down upon by a series of hulking peaks. $400 for 2 people, subject to availability. - Arrive Early is Not permitted during and including the following dates: 20 September 2019 - 13 October 2019. - Stay Behind is Not permitted during and including the following dates: 14 December 2019 - 20 January 2020. - Abu Dhabi stopovers are not available during and including the following dates: 29 November 2019 - 2 December 2019. - Rome (Pre Tour): $180 per room. - Venice (Post Tour): $180 per room. Rome Day 3: Vatican Musuems and Sistine Chapel tour: $180 for 2 people. Florence Day 4: Uffizi Gallery: $180 for 2 people. Florence: Day 4: Gallery of the Academy of Florence: $140 for 2 people. - The above optional tours will occur during your free time. The itinerary day may change due to scheduling and time restrictions. - Due to time restrictions, we recommend purchasing only one optional tour on Day 5 in Florence. Cruise: €10 (approx. $16 AUD) per person, per day, payable onboard at the end of the cruise. Additional extra’s on board will also have a gratuity of up to 18% charged on top. We recommend dressing in layers as there can be significant changes in temperature throughout the day. Wear good walking shoes, jeans or heavy cotton pants, a light cotton shirt plus a sweater/jacket and to fit in with the local Italians, a scarf. Expect temperatures ranging from highs of 16°C to lows of 7°C. During this month, in the Greek Islands the average sea water temperature for the beaches around the island is 20°C, which is just about warm enough to enjoy a dip. 27 meals are included in the tour, for all other meals; lunches and dinners the tour leader (when available) will offer assistance with reservations, suggestions and directions to local restaurants. It is your responsibility to notify TripADeal of any dietary requests/requirements. Please note; we will do our best to meet your requests/requirements, however cannot guarantee that we will always be able to.